Australia coach Robbie Deans is keeping coy about James O’Connor’s inclusion in the Australia squad for their World Cup opener with Italy. O’Connor is available for selection following a one-match suspension for missing the official World Cup squad announcement last month and his coach is keeping quiet about his plans for the Italy game. Following Australia’s 25-20 victory over New Zealand in the Tri Nations finale it would be understandable if Deans went with the side that secured Australia’s first Tri Nations triumph in a decade. However there is no doubt about O’Connor’s threat on the wing and the 21-year-old who has scored 11 tries and 147 points in his 30 Tests would walk into most, if not all of the sides in the world. Cooper was “gutted” to miss the Brisbane Test with New Zealand in which Australia claimed the Tri Nations crown and his suspension may well cost him his place in the side. Adam Ashley-Cooper was moved to the wing and Anthony Faingaa came in to the centre and Australia managed to score three tries in that game, although neither Ashley-Cooper not Faingaa managed to cross the tryline. O’Connor’s ability to kick penalties is a big asset to an Australian side lacking a natural goalkicker, and while Quade Cooper is more than capable of kicking at goal, O’Connor can kick from distance. Australia are 1/150 to win their opening World Cup game and the handicap betting prices the Wallabies at 10/11 with a -31 point start. 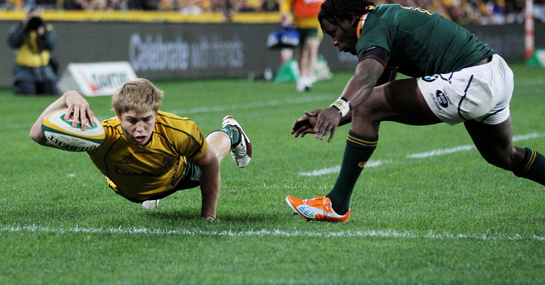 Following that win over New Zealand in the Tri Nations Australia were cut to 3/1 to win the World Cup and the Wallabies look the biggest threat to New Zealand on the basis of recent form. How they perform in the opening match with Italy will set the tone for their World Cup and punters can expect a solid performance from Robbie Deans’ side on Sunday.